Forays of a Finance Foodie: One Year Blog-Birthday! Woo Wee! Can you all (y’all) believe it? Almost one year since my first post! It’s been quite a journey for me as I went from novice blogger to…well…less of a novice blogger (at least my picture taking skills have improved). Pretty sick and easy-as-pie, eh? Contest ends on November 25, 2009 (a new juicer just in time for the Thanksgiving parties!) at 5pm EST. Winner will be chosen via random number generator and announced shortly afterwards. Good Luck! *Special thanks go out to Finance Foodie's cool and generous parents who funded initial site development, Team Finance Foodie whose stories / contributions have made the site 10x better what it could be if it were just the Finance Foodie, and all of the numerous PR firms that have made Financefoodie.com feel welcome at their events. Definitely the Air Hockey Tables! first post?? anyways, I came across a "MMG Vintage Cornell Baseball by Penfield, Edward" (framed picture of a Cornell baseball player from early 1900s) at the site and I have it give it up for my alma mater. Kinda random for a home decoration site, but pretty awesome nonetheless. I like the Enclume RACK IT UP! Expandable Rectangular Ceiling Rack. It would help out in my kitchen. I'd like to have the Greenland Home Fashions Ariel Mini Set bedding. I'm loving CSN Stores' shoe selection - why buy furniture when you can have a house full of shoes?! Happy Birthday! I'm really love the wall mounted cereal dispensers. So cute! Also, I just started following you on twitter (@funfearlessbean)! Happy Birthday! Ooooh I love juicers! I like the Kincaid Classics Baltimore Sleeper Sofa. This is what I want http://www.csnstores.com/Cuisinart-GR-3-CUI1086.html what a great deal on a panini press! Definately on my Christmas wish list! Panini press! I love me a pb and grilled banana sandwich! My husband would love the Video Gamer Chair. Thanks for the chance. Powell Medford Counter Height Dining Set looks great! I just adore the Kichler Pompeian Mosaics Six Light Pendant in Art Nouveau Bronze. I need new fixtures. they have a great selection of rugs! i may have to pick a few out! This is an all year round experience, coal grill in summer (yes I am a meat l<3ver!) and a fireplace inw inter...like the one in hotels yay!! I love the digital wireless baby monitor. i like the wine racks! I love the armless lounge chair in black! It's pur-ty. I think the Greenland Home Fashions Ariel Mini Set bedding is cool! I love the Powell Garden District Umbrella & Coat Rack. My choice is the Powell Color Story Butcher Block Kitchen Island in Black! I know this is a teeny weeny thing to love, but I fell in love with the Silvermark Grater Spoon in Stainless Steel - S04061!! What an AWESOME wee contraption! Happy blogiversary, heres to many more years! I love CSN, their selection is absolutely jaw dropping. I picked up a iittala pot from them for my mom and she LOVES it. I'd love to pick up the iittala All Steel 2 Qt. Sauteuse as well. Thank you (and CSN) so much for sharing this giveaway with your readers! My husband is using an old kitchen chair at his computer desk. The Winston Leather Executive Swivel Tilt Chair would be perfect for him. Hi! I really need new everyday dinnerware. I love the "Pfaltzgraff Patio Garden Series - Patio Garden Dinnerware Collection". It's perfect for my family. I love the giveaway item too! Thanks. Happy First Anniversary...I don't have a blog yet. You've done a great job! Oooooooh my son would love the video game chair! I like their Chelsea Pet Bed in Zebra wood for my dog! The product I think is cool is the Blomus Nexio Medicine Cabinet, Polished! I like the Gus Modern Sofa - which I need badly. I like the All-Clad Dutch Ovens. What a great giveaway! The Bathroom Vanity Cube is terribly cool! I like the no cell phone drawer pulls. I would love to have the Bosch Universal Plus Kitchen Machine with Blender. Bosch appliances are almost silent. What a coup! Anything from le creuset, especially a dutch oven! Happy Birthday! Love the air hockey tables. What I'd love from CSN is a Caphalon Non-Stick Pan- Ours met the trash today! So I live in a converted warehouse loft, and I would LOVE the Herbeau Seine Oval Sink Bowl in Hammered Weathered Copper. It would look great in here! Love the office furniture...I'd LOVE to have the CF Oakton Mureno Writing Desk...so stylish!! I think the cereal wall mounted dispensors are way cool! I like the Howard Miller Broderick Display Cabinet. I have lots of collectibles I could display in there. Thank you for the great give-away. TheWhitehaus Collection Vintage III Bridge Faucet with a Traditional Swivel Spout, Cross Handle and Side Spray is cool. I like to cook and eat, so I headed right for the cooking stuff. I really liked the Le Creuset 6 piece classic set in Caribbean. I love the pink tinted red wine glasses! They're a great blog giveaway sponsor. Awesome giveaway item!! Let's exchange links! I LOVE the George Kovacs Chandelier - P382-084, thanks! My son would love the video game chair. I also love the Colonial Mills Lincoln Chocolate Braided Rug. I love the blue Dot Nook Bed! I think the The Blue Rooster Gatsby Style Chiminea is very cool for the deck or patio. I like the Colonial Mills Boston Common Public Garden Braided Rug. I just love the Jasper Conran Chinoiserie White Dinnerware Collection. I like the "Acadia Furnishings Miacomet Slipcovered Swivel Glider"
... and can't believe how much stuff they have on this site! I could use the BonJour Cafe Latte Frother! I like the Doodle fish Rose Garden Kid Bedding set! Thanks! I like the CBK 5 Step Ladder Design Graduated Shelf. I could use a Le Creuset Skillet or dutch oven! Gotta have the calphalon 10 piece cookware set. I love the furniture. I know it's not kitchen related, but I've had my eye on the Prepac Black Sonoma Captain's Platform Bed for a while. South Shore Lexington Collection Nightstand that is just the coolest little night stand ever! I love the Armarkat 74" Faux Fur Cat Tree in Beige. Thanks for the great giveaway! I like the Herman Miller ® Eames ® Lounge Chair. Looks comfy! Following you on Twitter - clctaube. I love the SEI White Rattan Basket Sideboard. That's look great in my dining room! I hope I understood correctly that posting this on our blog got us an extra entry? Here it is! And congrats! Have been drooling over Le Creuset 5-Quart Oval Wide Oven in Caribbean for a while now. Ooo, their prices aren't bad either! I would love to have the Viking 7 Quart Stand Mixer in Black with Option Accessories. i like the Ferm Living Weed Tea Towel. bonjour cafe latte frother ty. A lot of my kitchen gear is out of date and decreppid, so I think the Rachael Ray Stainless Steel 10-Piece Cookware Set would be perfect! I love the Babette Holland Ostrich Table Lamp in Rust Horizon with Black Linen Shade! I like the Niagra Pub Game Table, really neat! 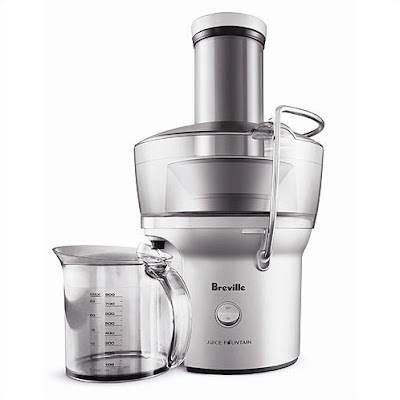 I've always wanted a juicer so this would be so fantastic, thank you! I think the Trump Home Mar-a-Lago Lorenzo Executive Chair in Dark Cherry - 01-0653-938-01 is pretty cool. I like the Shun Elite 7 Piece Essential Block Set. it's bright green...but I love it! I really like the Texas irons set of 4 best friends wine glasses. They have such a great variety of nice stuff! I love the Blomus Nexio medicine cabinet in matte. It would look so nice in my bathroom. i have always wanted an air hockey table!!! The grandfather clock looks amazing!! I'll dream big with the Life Span EL 3000 Elliptical Trainer. But what I've wanted all my life is one of those juicers!! I have my own orange and grapefruit trees, but, alas, no juicer! I love the Hamilton Beach DrinkMaster Classic in Chrome! I like the Ameriwood Carina Collection Adjustable Laptop Cart - NT20 GM. CSN has great customer service. Howard Miller Ty Pennington Niagra Pub Game Table - 699011 is groovy! I have a "thing" for globes and astronomy, so the Replogle Constellation Globe really caught my eye! Unique! I like the pasquini lux coffee grinder...hmm, the smell of freshly ground coffee.